and Kin 137 is call Ah Vuc Kab, Lord of the center of earth. 137 - It is call "Magic number" aswell. In physics, the fine-structure constant, commonly denoted α, is afundamental physical constant, namely the coupling constant characterizing the strength of the electromagnetic interaction. Being a dimensionless quantity, it has constant numerical value in all systems of units. Arnold Sommerfeldintroduced the fine-structure constant in 1916. The anthropic principle is a controversial argument of why the fine-structure constant has the value it does: stable matter, and therefore life and intelligent beings, could not exist if its value were much different. For instance, were α to change by 4%, stellar fusion would not produce carbon, so that carbon-based life would be impossible. If α were > 0.1, stellar fusion would be impossible and no place in the universe would be warm enough for life as we know it. There is a most profound and beautiful question associated with the observed coupling constant, e - the amplitude for a real electron to emit or absorb a real photon. It is a simple number that has been experimentally determined to be close to 0.08542455. (My physicist friends won't recognize this number, because they like to remember it as the inverse of its square: about 137.03597 with about an uncertainty of about 2 in the last decimal place. It has been a mystery ever since it was discovered more than fifty years ago, and all good theoretical physicists put this number up on their wall and worry about it.) Immediately you would like to know where this number for a coupling comes from: is it related to pi or perhaps to the base of natural logarithms? Nobody knows. It's one of the greatest damn mysteries of physics: a magic number that comes to us with no understanding by man. You might say the "hand of God" wrote that number, and "we don't know how He pushed his pencil." We know what kind of a dance to do experimentally to measure this number very accurately, but we don't know what kind of dance to do on the computer to make this number come out, without putting it in secretly! A personal NOTE: I first found about 1/137 on a book "SINCRONICITY" of Massimo Teodorani. About conexión Physics-Psique :Carl G. Jung and Wolfgang Pauli. 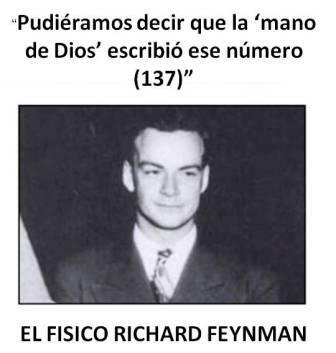 (Premio novel de Fisica en 1945). ¡¡¡ I am on room 137 !!! he said, the Fine-structure constant : 1/ 137 that he was, as many others, looking for understanding. 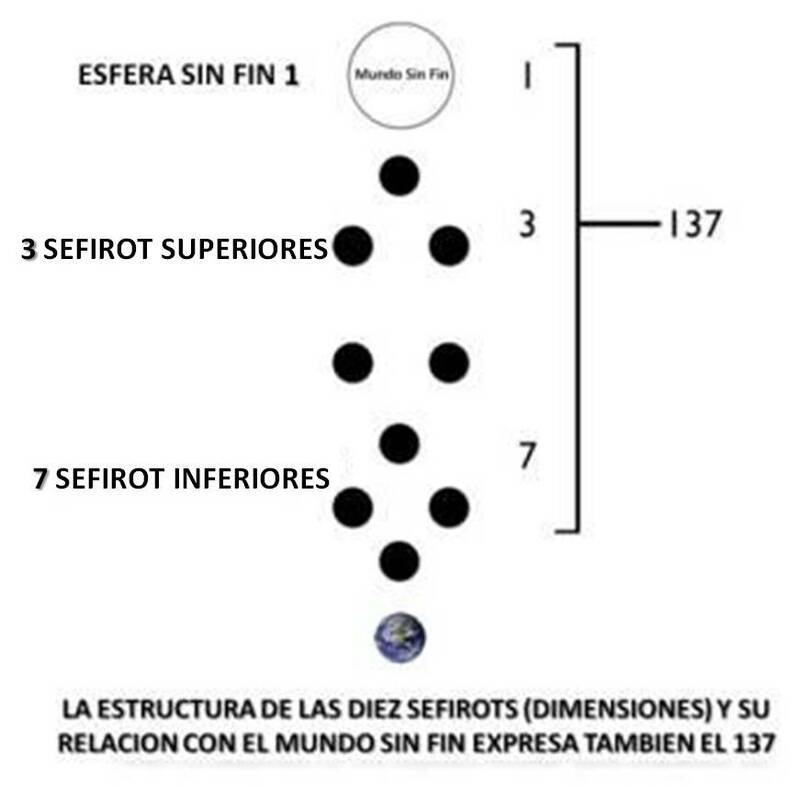 Por favor no te preocupes si no entiendes la ciencia y la física asociada con el número 137 (también conocido como la Constante de Estructura Fina.) Esto no es lo importante en este artículo. A propósito, la mayoría de los físicos no lo entienden tampoco. Pero admiten y saben que es el número más importante en el universo. Puedes buscar en googleluego si quieres saber más sobre cómo funciona en la física y por qué es tan importante. El número 137 en física corresponde a la interacción entre un electrón y un fotón o la probabilidad de que un electrón absorba a un protón. 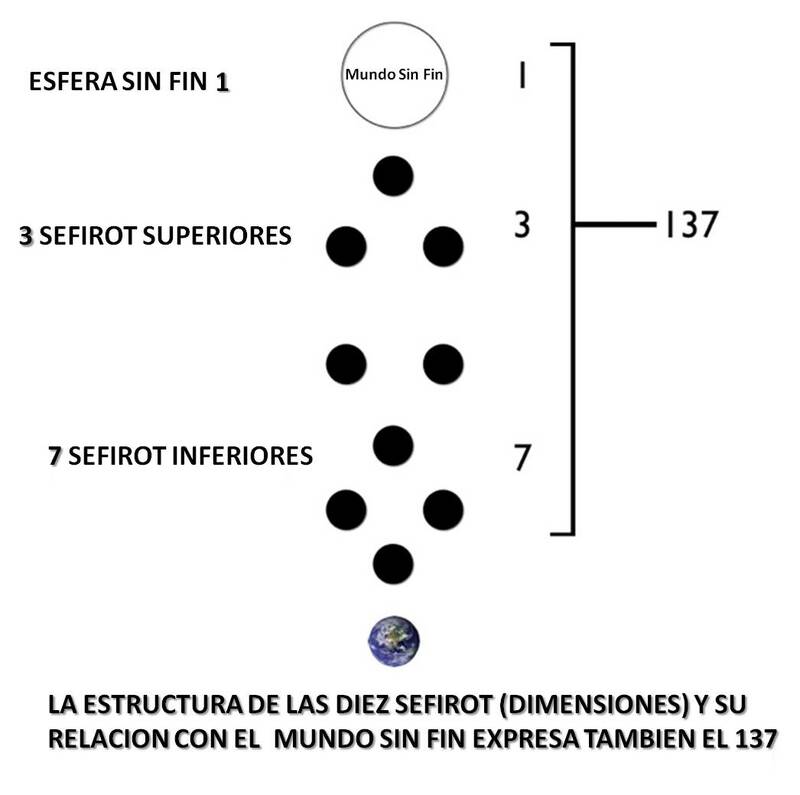 En el lenguaje de la Kabbalah, esto significa la interacción entre la Vasija y la Luz o cómo una Vasija puede absorber/recibir la Luz. Sabemos que estamos distantes y desconectados de la Luz cuando estamos opuestos en la naturaleza, porque en la esfera de conciencia o espiritualidad, polos opuestos se rechazan mutuamente. La única manera para que nuestro mundo físico (electrón) absorba (reciba) la Luz es imitando a la Luz, comportándose como la Luz yesto detiene la repulsión. A su vez, causa atracción.